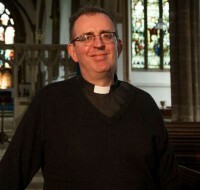 Richard Coles is today almost a fixture on our TVs and radios. The vicar of Finedon in Northamptonshire is of course a regular on Britain's TVs appearing in everything from Songs Of Praise to Celebrity Masterchef while on BBC Radio Four he has become the regular host of the Saturday Live programme. His wide knowledge and sharp wit has made him known to millions and few would argue that he is "Britain's most famous vicar." Two bits of Information that everyone, Christian and non-Christian, seems to know about Richard is that, with Jimmy Somerville, he was half of the '80s pop dance group the Communards (who achieved three Top 10 hits including the number one single "Don't Leave Me This Way"), and that he is a practising homosexual. Coles has been interviewed dozens of times but seldom in any great depth. Cross Rhythms searched out this record of a small press conference Richard gave to George Luke, Tony Cummings and Gavin Drake at the Greenbelt Festival in 2012 and which until now has remained unpublished. George: You are wearing several hats at this festival. Can you run through them for us? Richard: Gosh, how many hats am I wearing? Well, I was wearing a BBC Radio hat this morning for the Sunday Worship which came from Greenbelt. I don't think I'm wearing any other hats today - Sunday I'm observing properly. But I'm wearing a lot of talking hats too. Yesterday I was on a panel - one of the 10-minute short-talk slots; and tomorrow I am on a panel with Robin Ince; and I think I'm doing a solo spot as well tomorrow; and then late night talks as well. So I'm singing for my supper. Tony: So you feel qualified to talk about a wide range of subjects? Richard: I feel qualified to speak about nothing - that being the case I might as well speak about anything! Tony: That sounds like something GK Chesterton might have said! Richard: I wish! In fact, it probably was. Gavin: Can I ask a political question? Richard: Yeah, you can ask whatever you like. Gavin: I interviewed Peter Tatchell yesterday who was very critical, as you might imagine - no stranger there - of the Archbishops of Canterbury and York. He described Rowan Williams as 'colluding with the worst homophobes in the world' and he said the appointment of John Sentamu, if he was appointed as Archbishop of Canterbury, would be 'a disaster for the Church' because of his stance. As a Church of England priest, and a gay man, do you find such comments helpful, or unhelpful? Richard: I think what I have learned being in that slightly invidious position of being a priest in the Church of England - I hope a faithful priest in the Church of England - at the same time a reasonably well adjusted and cheerful gay man, is that I've learned the virtues of patience, I think. Where we are at the moment is a very difficult, intractable place, or so it appears. Clearly there are all sorts of people who feel very passionately and deeply about the issue on all angles and we are a long way from each other and I think we need to passionately approach each other, try to understand each other a bit better, and see what God has got to give us in terms of how we work this out. I don't know when that will be and I don't know how that will be; but I think patient enduring with each other is the way to do it. Gavin: So you wouldn't share the view, perhaps, that it would be a disaster for the Church if John Sentamu was appointed Archbishop of Canterbury? Richard: Well no! I don't think if John Sentamu was appointed to Canterbury it would make much of a difference to the overall issue which is one of patient endurance. We just have to be patient, charitable and kind with each other as far as we possibly can. And that might be really what we are called to do rather than arrive hastily at an answer that will alienate as many as it will include, however you answer the question. I don't want to be a bishop by the way, I REALLY don't want to be a bishop!